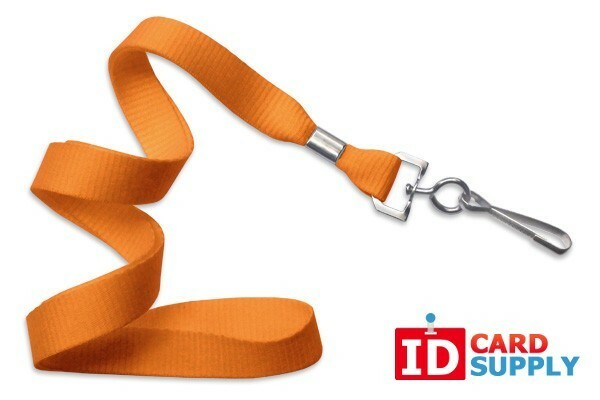 Orange Lanyard with 5/8" Strap and Swivel Hook Ending | 100 Pack from IDCardSupply! This bundle of 100 orange flat woven lanyards is offered to you at our special low price. Each lanyard has a 5/8" flat neck strap which is comfortable to wear all day long. The strap is made out of a microweave polyester, which is a soft yet durable. The swivel hook end fitting will attach to any slot punched badge or badge holder. If you need constant access to or visibility of your ID Card, these lanyards are the ones for you!